In this last week I have had the need to travel to both Sydney and Hobart for work. With the last big push for Melbourne Marathon underway I needed to run, but also the travel meant I could so without feeling bad for taking time away from the family to run so I managed to get some quality runs in. I must say though the difference in runs between the two cities was chalk and cheese. I was in Sydney on Thursday and Friday last week and planned all along to manage to use this trip to replace my long run on the weekend (weekend was my only two days at home so didn’t think a 3 hour absence would go down well…) but at the same time I didn’t want to commit to doing 30km as it didn’t really fit into the timeslot I had so, so instead I ran 18km on Thursday evening and 26km on Friday morning. Thursday’s run saw me run from the CBD over the bridge and around the northern beaches to Mosman and Neutral Bay. I thought I would be able to run along the harbour and enjoy the waterviews. Wrong. Due to the fact that the harbour on the northside is largely private property it meant running inland along roads with very few waterviews. Part of my disappointment was certainly due to my lack of pre-planning a route, but it was a pretty frustrating experience. It was a pretty hilly run in the end and when I got back to the hotel I saw it was 27 degrees which explained why it felt a bit harder than usual. The second run was much more enjoyable, I ran from the CBD up Oxford St all the way to Bondi Beach and then back along the coast. This had a gradual incline on the way out until the beach and then a few hills on the way back but was a much more pleasant and scenic run. The killer on this one was the humidity, I got back to the hotel and was drenched. The legs certainly also felt the run from the day before. Usually in Sydney I just run around Darling Harbour/Mrs Macquarie’s Chair, etc but knew that wasn’t going to get me the distance I needed for these runs. On Monday and Tuesday work took me to Hobart and I came in thinking that despite having two runs planned, I was a bit run down and thought I would get one at the most. It turned out to be two of the most enjoyable runs in a while. 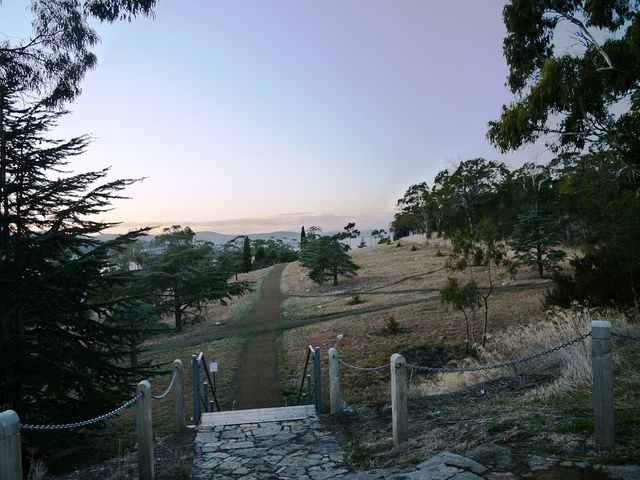 On Monday afternoon I headed out of the city up to the Domain and discovered a trail called the Soldiers Memorial Walk. I had grown up in Tasmania but had never heard of this before and since found out it was upgraded after I had left. This was a nice gravel trail up through parklands where originally the Hobart community had planted 510 trees for soldiers from Hobart killed in World War 1. The upgrades had seen plaques installed to commemorate the soldiers and told a short story of each of them, what unit they were in and where and how they were killed. The parklands were beautiful, I had uninterrupted views of the Derwent River and I literally had to watch my step for rosellas sitting on the side of the path at regular intervals. It was like an untouched world. The trail itself went for about 3km and then I followed some other paths up to a look out before returning via the Domain Athletics track for a few laps and then the gradual descent down the trail. All up I did a leisurely 12km and it was thoroughly enjoyable. My second run in Hobart was again one that I had thought of skipping, but I woke early and saw it was a nice day out so instead pulled on the runners and did an interval session around the Cenotaph, Regatta Grounds and Domain. It was pretty peaceful and I was able to do 8x600m with 60 seconds rest in between and felt invigorated to start the day. I wouldn’t really like to say I preferred one location over the other as they both offered great challenges and different benefits for running. The warmer weather in Sydney was a great reprieve from a Melbourne winter but the stillness and easy ability to escape to nature in Hobart was a true thing of beauty. Either way it reinforces to me that if I’m traveling for work the most important thing to pack is my running gear so that I can get out of the hotel room and truly explore the city I’m visiting in a way that many people can’t or don’t.